Unless you just beamed back to Earth you know that, last week, Leonard Nimoy passed away at the age of 83. 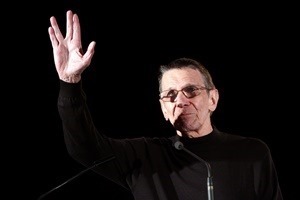 Nimoy played many roles during his life, but he will be best remembered as Mr. Spock – the half-human/half-Vulcan science officer and first officer serving under Captain Kirk on the USS Enterprise. As Spock, Leonard played a character who was both apart from humanity and part of it. Someone who observed human traits from afar and dealt them himself. I was first introduced to Star Trek in middle school by a friend of mine. (The same friend who would later help me overcome some severe bullying by talking to the bullies and getting them to stop.) While I enjoyed both the original series and The Next Generation sequel series, I identified the most with two characters. In Next Generation, it was Data – the android who couldn’t feel emotions himself but tried his best to understand them. In the original series, though, I most identified with Spock. As Scott Kurtz put it: "I was an introverted math obsessed child who felt completely out of place among my friends. Mister Spock is my spirit animal." He was having a character in his comic strip describe herself, but he might as well have been describing me. At the time, I didn’t know anything about Asperger’s Syndrome. I didn’t know why I was the way I was. All I knew about Autism was gleaned from the movie Rain Man which meant I thought it meant you talked kind of funny and could count popsicle sticks when they were dropped on the floor. Still, I knew there was something different about me. I didn’t "get" social situations like other people seemed to. I felt both apart from society and drawn to it. I couldn’t stand the spotlight yet craved to be in it. It was all too easy to imagine myself as Mister Spock observing the interactions of humans as they went about their daily business, trying to find a logical reason for it all. Somehow, not being part of it all seemed slightly less painful when I was purposefully acting as an observer. Yes, Kirk was the man in charge. Scotty could rig anything to work in half the time he claimed it would take. Bones was cantankerous but an excellent doctor. However, it was Mister Spock whom I felt the closest to. None of that would have been possible had it not been for Leonard Nimoy’s wonderful acting. He brought lift to a beloved character and embraced it even after Star Trek left the air. The original Star Trek was always supposed to be an optimistic view of the future. A beacon of hope. Leonard Nimoy’s acting certainly helped to give me hope during a dark time. Farewell, Mr. Nimoy. You lived long and prospered. May your memory endure for generations to come via the characters you brought to life. NOTE: The photo of Leonard Nimoy above is by Gage Skidmore and is released under a Creative Commons Attribution-Share Alike 2.0 Generic license.